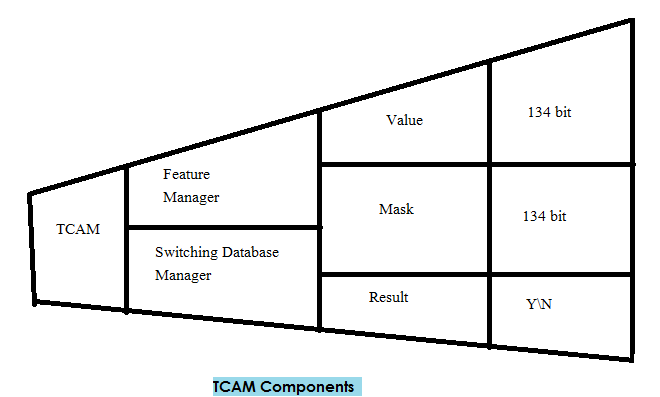 Today I will discuss about Layer 2 Switching process. A Process of using the MAC address on LAN is called Layer 2 Switching. Layer 2 Switching is the process of using hardware address of devices on a LAN to segment a network. Switching breaks up large collision domains into smaller ones and that a collision domain is a network segment with two or more devices sharing the same bandwidth. Ethernet is a LAN technology based on the IEEE 802.3 standard. It provides a shared medium to transfer the data. Cut through (Fast Forward)- When in this mode, the switch only waits for the destination hardware address to be received before it looks up the destination address in the MAC filter table. Cisco sometimes calls this the fast forward method. Fragment Free (Modified cut through)- This is the default mode for the catalyst 1900 switch, and it’s sometimes referred to as modified cut through. In fragment free mode, the switch checks the first 64 bytes of a frame before forwarding it for fragmentation, thus guarding against forwarding runts, which are caused by collisions. Store and forward- In this mode the complete data frame is received on the switch’s buffer, a CRC is run, and if the CRC passes, the switch looks up the destination address in the MAC filter table. Address Learning– A switch learns MAC address based on Source MAC. Forward Filter Decision– A switch forwards a frame based on destination MAC. Loop Avoidance– Switch use STP to prevent a network from looping. We always use Store and forward switch. Flooding – A process of transferring a frames copy to its all ports except that port on which it was received. If the destination is in the same subnet or network then a device directly sends the packet to the destination. If destination is not in same subnet or network then a device directly send packet to default gateway. 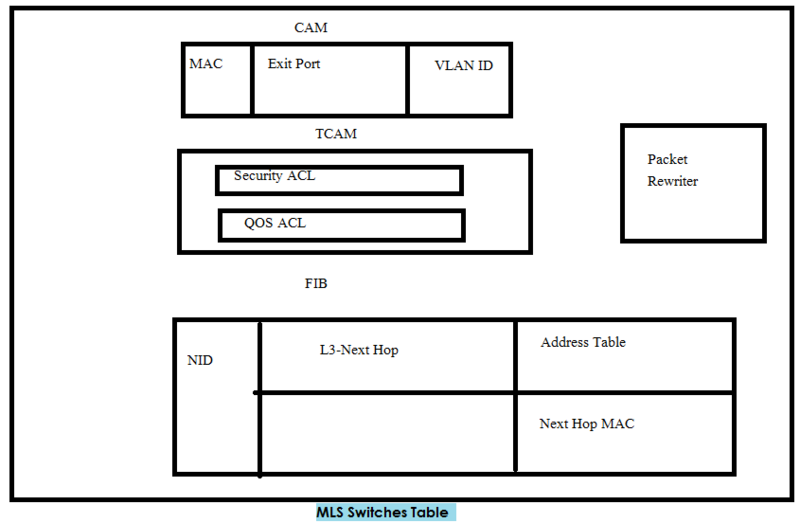 Layer 2 switches learn MAC addresses automatically, building a table which can be used to selectively forward packets. For example, if a switch receives packets from MAC address X on Port 1 it then knows that packets destined for MAC address X can simply be forwarded out of that port rather than having to try each available port in turn. In layer 3 switching packets are forwarded based on destination L3 information as a router does. Packets are forwarded with high speed as compared to router. Packets are switched using dedicated hardware. In layer 4 switching TCP & UDP port numbers are checked. In Multi-layer switching Data is forwarded based on L2, L3 & L4 information. As a router maintain routing table just like this a MLS maintains FIB. Before understand VLAN we have to understand LAN. A LAN consists of all devices in a single broadcast domain. Broadcast Domain- A set of LAN connected devices in which when a device sends a broadcast then all devices get a copy of frame so LAN & Broadcast domain are same thing. By default a switch consider its all interface in a single broadcast domain but a switch has ability to put some interface in one broadcast domain & some interfaces in another broadcast domain. These new broadcast domain are called V-LAN. Static Vlan- Static Vlan provides port based Vlan membership. 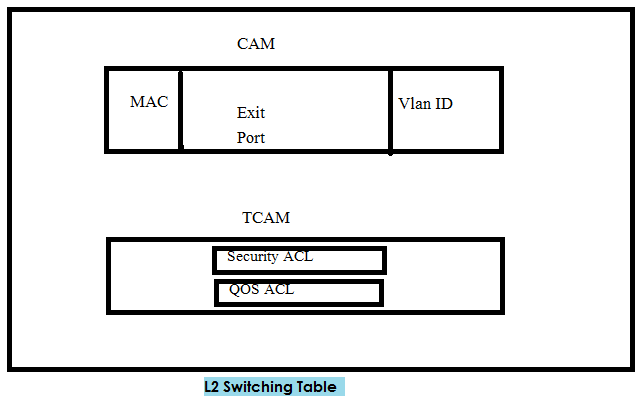 In static Vlan we configure switch ports in a particular Vlan. When we manually add switch ports to specific vlans. Dynamic Vlan- Dynamic Vlan provides Vlan membership based on MAC. When any end device is connected with the switch, then switch learn the MAC address of end devices. After learning MAC it sends a request to VMPS (Vlan Management Policy Server) that I have a MAC, now tell me VLAN ID of this MAC. Now VMPS is responsible for Vlan assignment based on MAC. Now a day we use AAA (Authentication, Authorization & accounting) for dynamic vlans. It works based on username and password of a user. When a switch sends a frame to another switch then it adds an extra header with the frame which contains VLAN ID of frame. This process is called VLAN trunking or tagging. ISL (Inter Switch Link)- it is a cisco proprietary protocol. It encapsulate original Ethernet frame with ISL header & trailer. It inserts 26 bytes header & 4 bytes trailer. This process is also called dual tagging. It doesn’t support untagged data and native vlan. 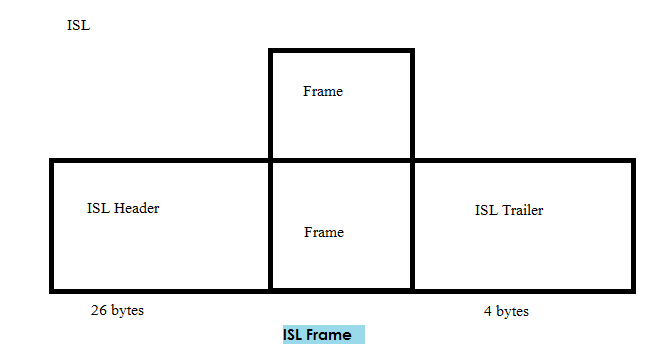 802.1Q– It is an open standard protocol. It doesn’t encapsulate original Ethernet frame with dot1Q header & trailer but it insert 4 byte dot1Q header in original Ethernet header. It supports untagged data and native vlans. DTP (Dynamic Trunking Protocol)- Cisco proprietary protocol. Before run this command we need to make this interface at least part of access list or trunk link. Only we will be able to run this command. VTP Version 3 supports Extended Range. Trunk– This setting place the port in permanent trunking mode. DTP is still operational so if the far-end switch port is configured to trunk, DD, or DA, trunking will be negotiated successfully. DD – (Dynamic Desirable) the port actively attempts to convert the link into trunking mode. In other words, it asks the far-end switch to bring up a frame. If the far-end switch port is configured to trunk, DD or DA mode, trunking is negotiated successfully. DA – (Dynamic Auto) the port can be converted in to a trunk link, but only if the far-end switch actively request it. Therefore, if the far-end switch port is configured to trunk or DD mode, trunking is negotiated. Because of passive negotiation behavior, the link never becomes a trunk if both ends of the link are left to the Dynamic auto. In all these modes, DTP frames are sent out every 30 sec to keep neighboring switch ports informed of the links mode. FDDI – fiber distribution data interface. By default idle CAM table entries are kept for 300 seconds before they are deleted. We can change the default setting using the following command. By default, a catalyst switch detects an error condition on every switch port for every possible cause. If an error condition is detected the switch port is put in to the errdisable state and disabled. We can repeat this command to enable or disable more than one cause. By default ports put into the errdisable state must be re enabled manually. This is done by issuing the shut down and then no shut.